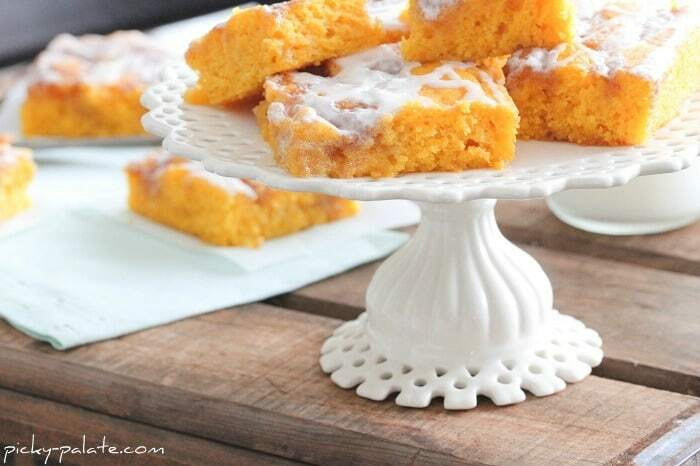 Sharing my Cinnamon Roll Pumpkin Vanilla Sheet Cake today! This sheet cake is simply perfect for your Holiday Dessert table, packed with sweet cinnamon flavors. Making a cinnamon roll recipe might be some of my favorite desserts ever. If you love cinnamon rolls, I think you are going to love my simple “perfect for Thanksgiving” texas sheet cake recipe! 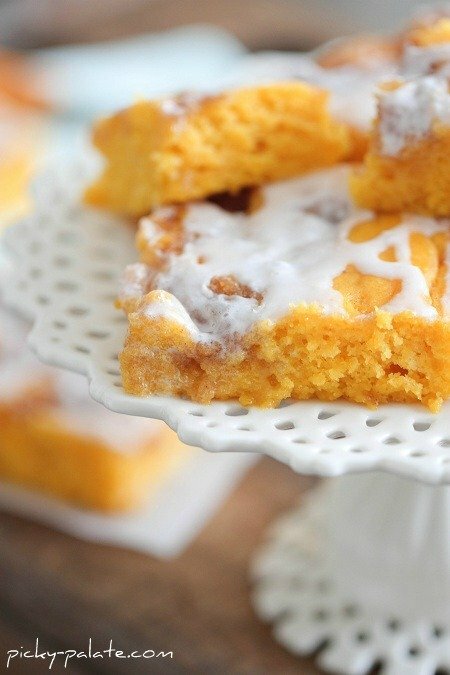 Here I give you my Cinnamon Roll Pumpkin Vanilla Sheet Cake. I love watching the reaction of my boys sampling my baked goods. I gave them a bite after school a couple days ago of this sheet cake and their expression was priceless. 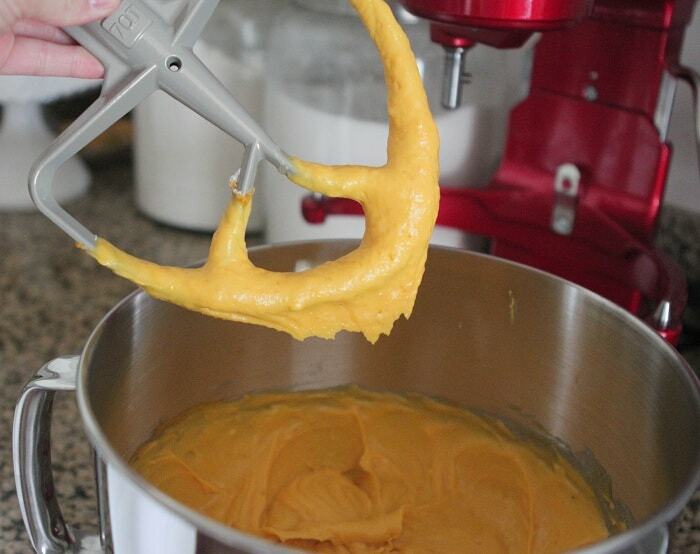 Don’t let the cake mix in the recipe scare you away. I assure you, no one will know this is a jazzed up cake mix recipe. 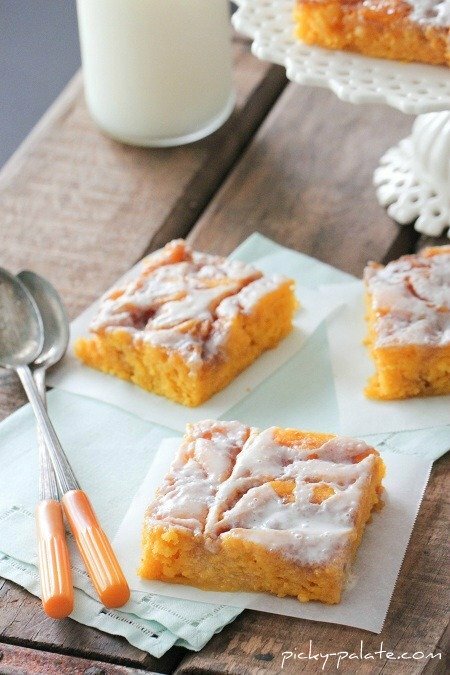 It is gooey and tastes just like a sweet pumpkin cinnamon roll in square cake form. Be sure to follow Picky Palate on Instagram where you’ll get sneak peeks of what’s coming to the blog! Enjoy!! Here you have your line up of ingredients. You are likely to have most of these things in your kitchen right now! Sheet cakes are simple, one-layer, frosted cakes that are often prepared for celebrations that involve a dozen or more participants. This type of cake has become a popular option for birthday parties, celebrations in the workplace, and family reunions and anniversaries. What Size Pan Do I Use For a Sheet Cake? I prefer the half sheet size. A half-sheet cake is typically baked in a 12-inch-by-16-inch pan, but may also be made in a 11-inch-by-15-inch pan. A half sheet typically feeds 40 people. It can be sliced into 32 2-inch-by-3-inch slices or 48 2-inch-by-2-inch pieces. Let’s get this party started 🙂 Start with dumping all of the cake ingredients into the mixer. No particular order. I added the pudding mix next. Oil, milk and sour cream. 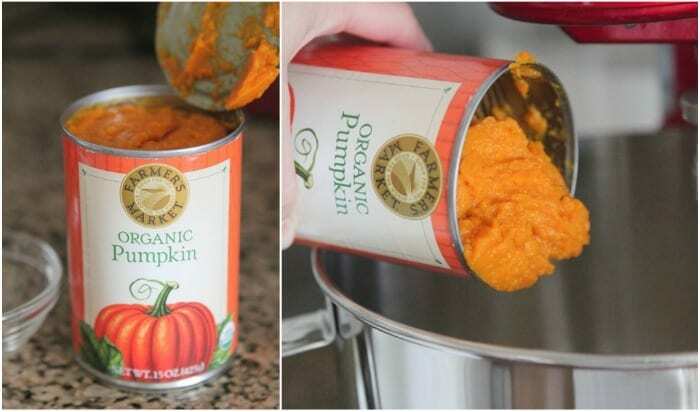 Add a can of pumpkin. 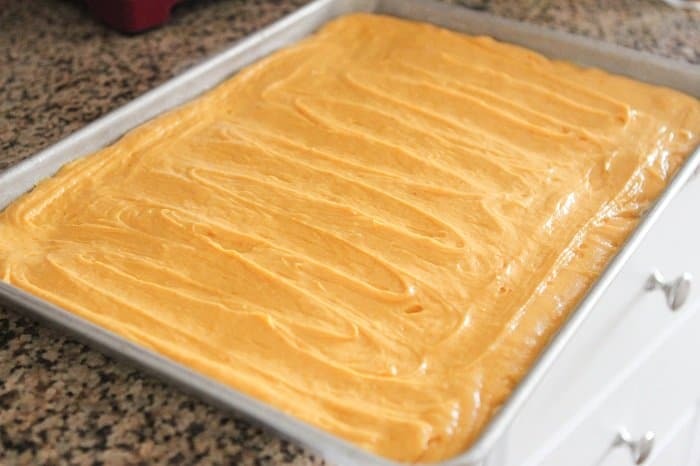 Transfer the sheet cake batter to the prepared baking sheet. Spread the cake evenly to the edges. 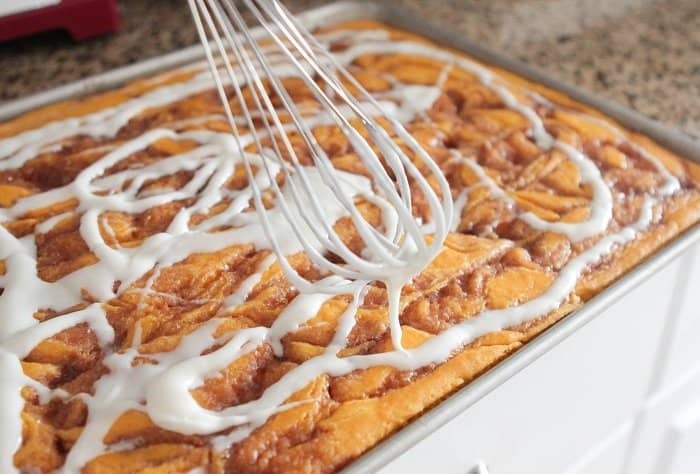 Drizzle the cinnamon mixture over your sheet cake. Run a knife through to swirl the goodness then bake 350 for 30-35 minutes. Here’s a shot of how it looks right after baking, wait until you smell the aroma! When the cake comes out of the oven, whip up the drizzle. Drizzle while the cake is still warm…. Try serving warm with a small dollop of vanilla ice cream too. Preheat oven to 350 degrees F. and spray a half sheet size baking pan (13 x 18 x 1) with non stick cooking spray. 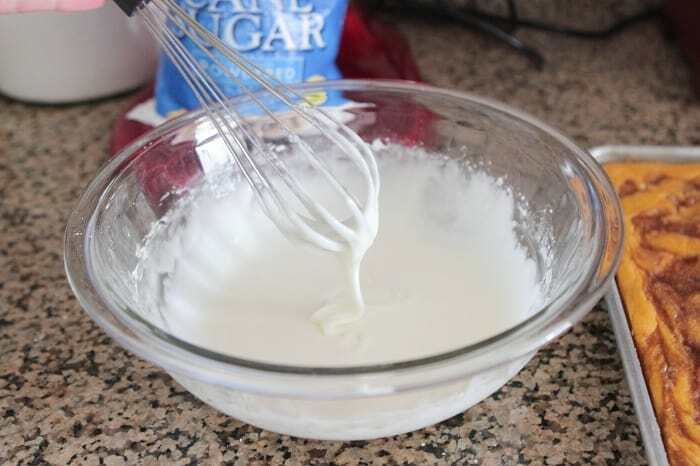 Place cake mix, eggs, oil, milk, pudding, sour cream and pumpkin into a stand mixer or electric mixer, beating until well combined, about 1 1/2 minutes. Pour into prepared pan, spreading evenly. Place butter into a microwave safe bowl and melt, about 30-40 seconds. 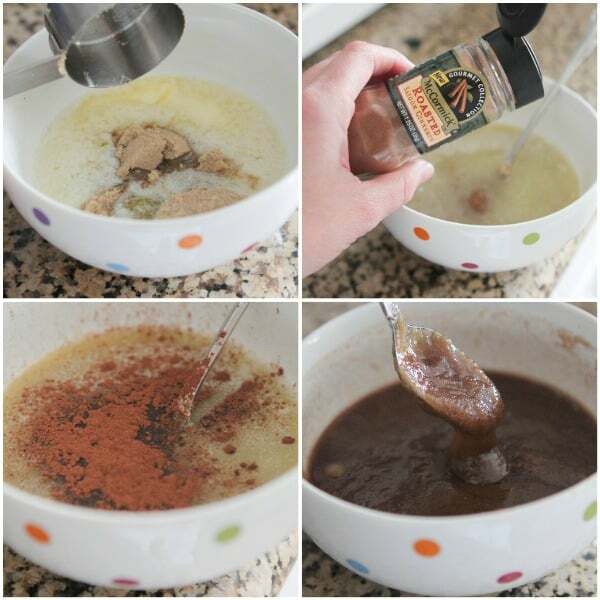 Add brown sugar and cinnamon to bowl, mixing until combined. Drizzle mixture evenly over cake then take a knife and run it through to swirl. 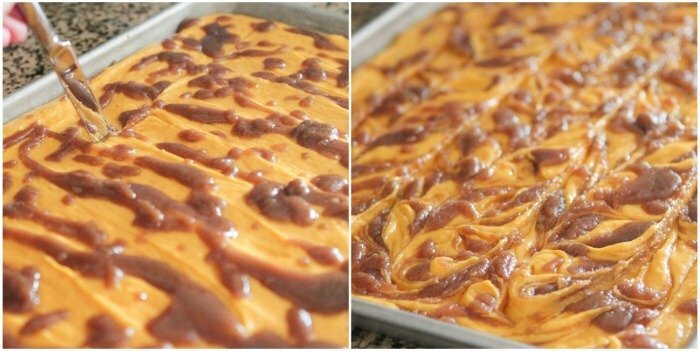 Bake cake for 30-35 minutes, until cooked through and remove. 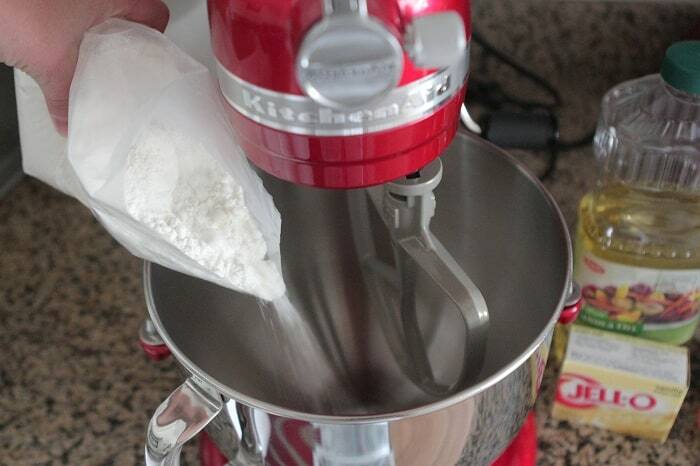 Place powdered sugar and cream into a large bowl and mix until creamy and smooth. Drizzle over warm cake then let cool for 20 minutes before cutting into squares. Refrigerate if not serving same day. Enjoy with milk! Hey girl! So glad you are going to give this one a try, it is going to be a regular at my house 🙂 Hope you have a great day!! This sounds really yummy. I think I will make it for Thanksgiving but I will leave the sugar frosting off and spread with vanilla ice cream and roll it into a ice cream roll. Omg Jenny!! I saw the teaser pics on Instagram and was seriously waiting for this one. Thank you for being amazing and making something that I just have to have, asap. I love that you said that you enjoy watching your boys’ reactions to your baked goods…I do the same thing w/ my family. I can tell when I have a hit on my hands by a 4 yr olds reaction. Kids can’t fake it. ha! I just pinned this to my Pumpkin Board on pinterest, too. I seriously love trying out my recipes on my boys, because like you said, they will tell you the truth…good or bad 🙂 Thanks for your sweet comments!! This is awesome! Love how simple it is to jazz up a simple box mix and it looks absolutely delicious! I’m sure this cake is very yummy and great for this autumn time! Oh my, I need a huge slice immediately! this is so dangerous and i don’t even care if i eat the whole thing! This sounds so yummy! I’m loving the photos! this sounds delicious! 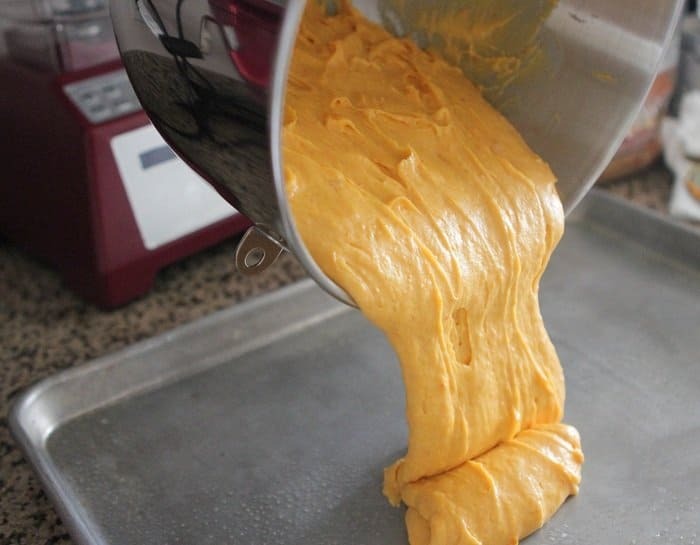 I have only one question: if I were to do this without a cake mix (since I never have those on hand), what are the parts that I would add to my regular yellow cake batter to achieve the yummy result? The sour cream and pumpkin and pudding? and of course the cinnamon and glaze. Thanks! I always enjoy seeing what you have created, I just wish I knew how to alter the recipe to use a scratch cake batter instead of the box. I may buy a box of mix just to make this for this weekend, though. 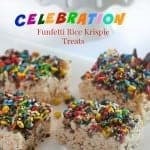 I am making treats to bring to a Horse Rescue Barn’s open house and I’m sure these would be a hit! Since I haven’t tried this recipe any other way, I can’t say what substitutions to use. You could do some experimenting though 🙂 Have fun!! 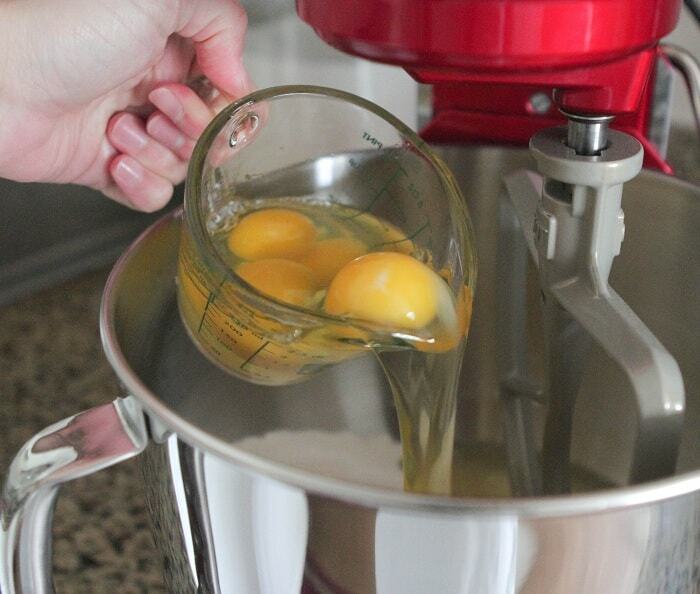 I found a homemade yellow cake mix at http://www.lifewithchickens.com I may try that soon. I’ll let you know how it turns out. Wow! This looks amazing! Can’t wait to try it. I love, love, love Fall for this very reason! I agree Sarah, I love Fall baking!! Oh my goodness – I want one of those for breakfast!!! I can’t stop swallowing…this looks divine! I can’t wait to make this. I’m having evil cinnamon roll thoughts now, but I forgive you. This looks awesome, Jenny! I see that you are using a new kind of cinnamon. Do you find that it makes a difference in your baking. Do you prefer that over “regular” cinnamon. You know Lisa, I don’t find a huge difference in the cinnamon. 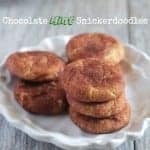 This one photographed is a touch stronger than the regular cinnamon, but I wouldn’t go out and buy a new one just for this recipe 🙂 Hope you enjoy!! That looks great! I don’t usually like to use cake mixes, but I think I definitely would in order to give this a try! We’re pumpkin-holics!! I can’t wait to try this one!!! Surprise my daughter with it! She lives for pumpkin season!! Us too Sandi! Hope your daughter enjoys! oh my gosh jenny!! this looks so gooey and delicious! perfect. This recipe looks amazing – quick question, in the ingredients you put 1/2 stick butter but put 8 Tblspn – is it a half or full stick of butter? Thanks so much!!! Thanks for catching that Jeanne, just edited it. Should be 1 stick 🙂 Have a great day!! Looks amazing! Love fall & all the pumpkin stuff! I was looking for something for an early Thanksgiving dinner this weekend, and this will be perfect! THANK YOU! I cannot wait. Show stopper, for sure!! Yeah, I bet your house was smelling amazing once you pulled that bad boy out of the oven! Yum yum yum! As my daughter would say, these look so hackin awesome! I can’t wait to try these! Wow – I will definitely be trying this one out! Of course, to be fair, he doesn’t like pumpkin pie and because of that I’ve not tried anything else with pumpkin so this just might work. It looks SO good though that I have to try. 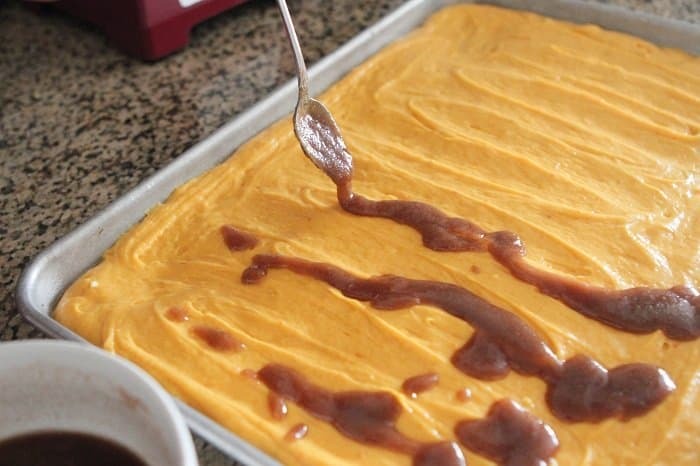 My son and his fiancee will be stopping by next week and she just LOVES pumpkin so that might be the night to try this just in case hubby doesn’t like it. That way I can send it home with them so I’m not ‘stuck’ (oh wouldn’t THAT just be horrible? haha) with the leftovers. 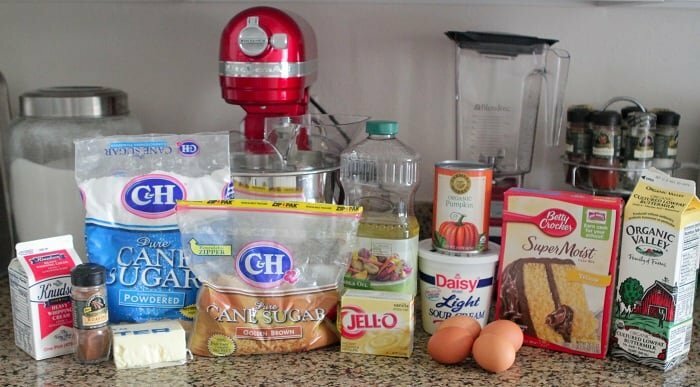 I love how you use a box of cake mix to make so many different and amazing things, this is no exception! Love it. Oh my gosh. This looks amazing. On my weekend to do list, for sure! I will definitely make this on Saturday. My cousin’s son is turning one…and there’s always room for an extra cake, right? This looks amazing! 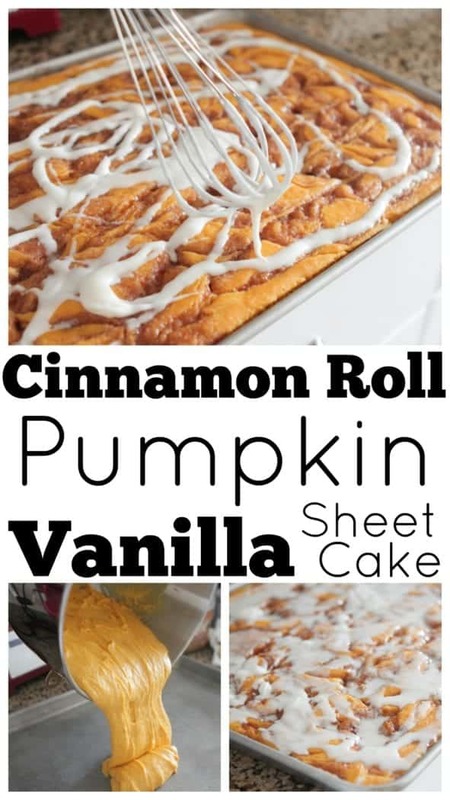 I just made some pumpkin cinnamon rolls, but this is a super easy alternative that I could make while I’m up at school! First of all, this looks delicious and I can’t wait to try it. I LOVE pumpkin!! Second, I have a question. I don’t have a jelly roll pan. How much time do you suppose it would take to bake in a 9 x 13 pan? I was wondering the same thing. Help! Yes!! Wondering the same thing! 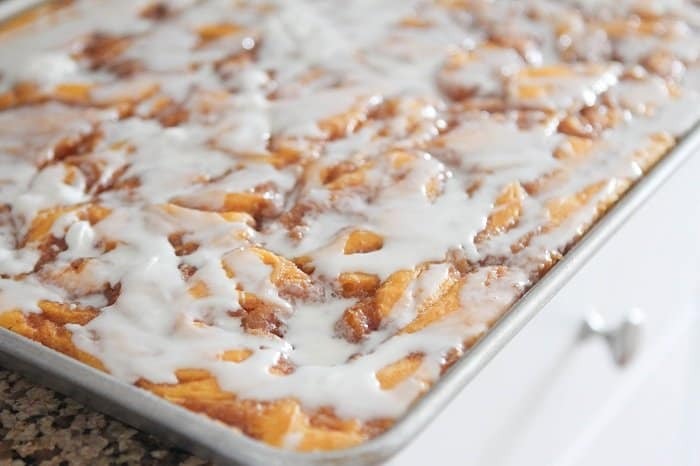 Dying to make this but kind of difficult without a jelly roll pan. What modifications should be made to the recipe to have it fit in a 9×13 pan??? Wow, these look amazing. I just blogged about how I don’t like pumpkin things because of my dislike for pumpkin pie, but this just might be the recipe that changes my mind. Also, beautiful pictures as always! Looks amazing! 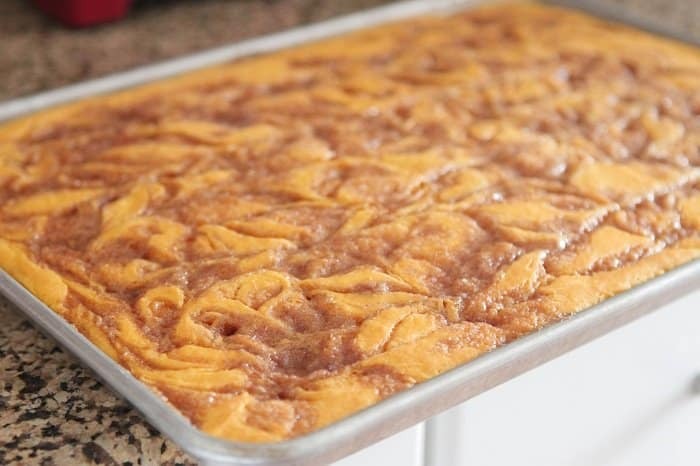 But, I don’t have a sheet pan….can you use a regular cake pan? Or will it be too gooey since it’ll be thicker? Maybe it was just me, but I attemped to create this in a cake pan and it collapsed in few places. I would NOT recommend it! Oh good to know, guess the 9×13 is out of the question 🙂 Hope it was still edible for you!! It was still delicious, but it was a little bit too gooey and not pretty enough to take with me! Will try again with the pan you used! I think it’s a 1/2 sheet pan, 18×13. Split the batter between (2) 9×13’s and you should be whistlin’ while you drizzle. I have to make this! Looks amaaazing! Do you think this would work with sweet potatoes too? I’m sad to say I’m not a pumpkin fan, but sweet potatoes, yum! 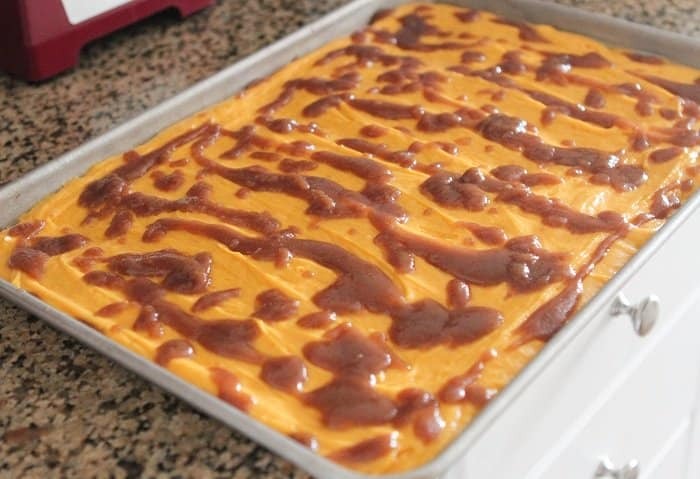 I haven’t tried it, but sweet potatoes seem to have the same consistency, give it a try!! It finally got “cool” here in South Florida (60 at night)… This weekend might be perfect for it! But you’ve given me another idea to play around with! Thanks! It looks delicious! 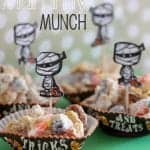 oh my goodness I am most definitely making these this weekend! Okay, this recipe is officially dangerously good! I will be making it for Thanksgiving and Christmas for sure. I love the simplicity of it! That looks amazing! All the flavor of a cinnamon roll without all the fuss. Fabulous! Made this tonight – AMAZING!! Thank you so much! Kim, was your glaze thin enough to drizzle? I used the exact measurements of heavy cream and sugar and it was too thick to drizzle! Thanks Jenny! One last thing, there are different sizes of jelly roll pans, what size do you have? I have the same question about the jelly roll pan Jenny! What size?? Yes wondering about the jelly roll size pan you used – thanks! Couldn’t wait to get home to try this recipe. Love it 🙂 Shared some with my sister who doesn’t like pumpkin and SHE loved it too. I will have to say that is one of the best looking recipes I have seen. Your photography is also very nice. I just know that would not last long around our house. Yummy, yummy! I am in heaven! and hungry now!